As instruction by the GenieMate Jill Ball I am doing a Trove Tuesday so I can share on social media with the #TroveTuesday. I have read a few over Trove Tuesdays over recent years but do not really know what is expected of me. 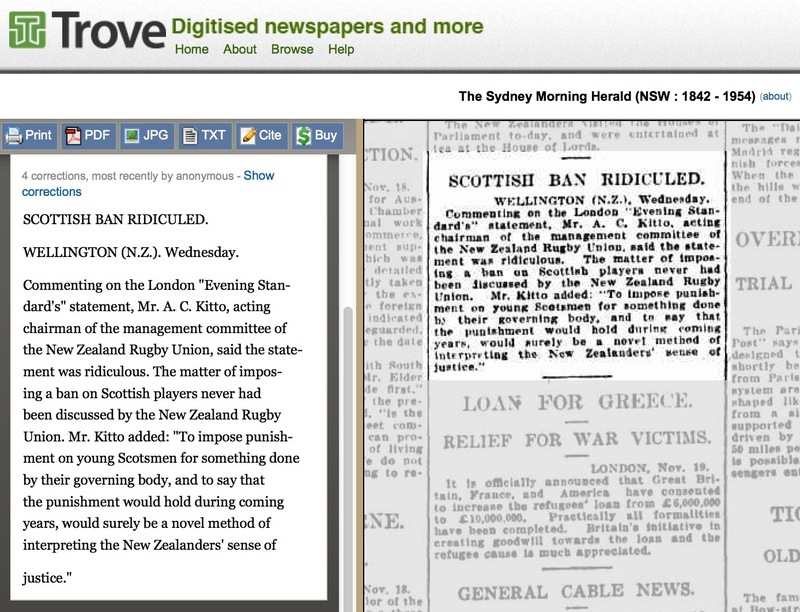 Even if you do not have a number of Australian ancestors it is still possible to find digitised newspapers with articles about them. Trove has a great citation system that give you a range of citation styles and is easy to copy. The copyright information was not easy to understand. Images were not allowed to be used for commercial use. A more simple to read and easy to find user friendly summary linked to the more legal jargon pages might be useful. It is very easy to correct the OCR so that the text is correct. My paternal Grandfather, Dolph Kitto, commenting on something that was written in the London Evening Standard. He makes it clear that at a New Zealand Rugby Union meeting a ban on Scottish players was not discussed. This Trove Tuesday post also is part of My family History for 24 November 1924. Thanks for joining the #TroveTuesday gang. Pleased to see Trove has something for folk from across the ditch.